FILE - People cool themselves at the Trocadero Fountain in front of The Eiffel Tower in Paris on July 27, 2018, as a heatwave continues across northern Europe. Arrayed between elegant stone buildings and run-down railway tracks in the northwest of Paris lie bustling playgrounds, plant-filled ponds and stretches of lush grass. The Clichy-Batignolles area, a former industrial wasteland, has morphed into the French capital's first "eco-neighborhood," billed as a model of sustainable development for the rest of the city. Clarisse Genton, project coordinator for the Clichy-Batignolles district, said it aims to be "environmentally responsible" — with solar panels on homes and clean geothermal energy for heating, for example. But the eco-effort also has a social aim: to address the city's affordable housing crisis and ensure green benefits reach the poor as well as the rich. "We wanted to create a district that's accessible to all and to bridge the gap between poor and rich parts of the city," said Genton, referring to the neighboring posh district of Monceau and the poorer La Fourche. FILE - An aerial view is seen of the construction site of the new Paris courthouse in the urban development zone of Clichy–Batignolles, northwest of Paris, July 14, 2016. Paris is one of more than 70 cities worldwide that have pledged to become "carbon neutral" by 2050, meaning they will produce no more climate-changing emissions than they can offset, such as by planting carbon-absorbing trees. Each is going about achieving the goal in its own way. But because cities account for about three-quarters of carbon dioxide emissions, according to the U.N., and consume more than two-thirds of the world's energy, whether they succeed or fail will have a huge impact on whether the world's climate goals are met. "Cities are where everything comes together: homes, transport, public spaces — so there's a real role for them to help create the living places of the future," said Eliot Whittington, director of the Prince of Wales' Corporate Leaders Group, a coalition of businesses promoting climate action. "We've got to a state of accepting a certain level of waste and energy [use], but climate change [and] heat waves affect us all and have a real toll on people's lives," he told Reuters. Global warming is currently set to exceed the more ambitious limit of 1.5 degrees Celsius (2.7 degree Fahrenheit) called for in the 2015 Paris Agreement to curb climate change, according to a draft U.N. report due for publication in October. From swimming pools heated by sewage to ensuring the city is fully "cyclable" by 2020, it includes more than 500 initiatives to reimagine Paris as a zero-carbon capital. The Clichy-Batignolles area of 54 hectares (130 acres), once chosen as Paris's Olympic village as part of the city's failed 2012 bid, is built around a 10-hectare park containing a skate park, deck chairs and wooden bridges. Martin Luther King Park acts as a "green lung" and an "island of coolness" for the neighborhood, said Genton, showing a miniature model of the district to two passersby. "Rainwater is channeled toward wetlands rather than discharged into sewers, and household waste is collected through an underground pneumatic system — removing the need for garbage trucks," she added. Panels of a photovoltaic power station are installed on the roof of a building in the new Clichy-Batignolles district in Paris, Oct. 22, 2012. But the eco-district is about more than energy efficiency and biodiversity, said Genton, adding that "we urgently need affordable homes in a city that cannot grow and where prices are skyrocketing." Half of the neighborhood's newly built flats qualify as social housing and can be rented for about 300 euros a month, she said. Local residents have so far warmed to their new neighborhood, and say they feel "more connected" to the rest of the city, she said. 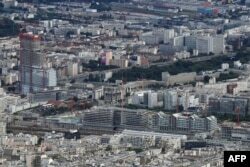 Virgile Geraud, a retired carpenter who has lived in Clichy-Batignolles for 40 years and is considering renting one of the new homes, said that "this new park, these new buildings ... it's really nice, it's a change of lifestyle." "But some people think the new buildings are too tall or too modern," he added, pointing to a bright yellow crane looming over a half-completed building. Denis Musanga, who two months ago moved to Clichy-Batignolles from the Paris suburb of Villiers-le-Bel, said he was "shocked by how clean it is, even at night." He is less convinced of the "affordable" label, however, saying that he pays 650 euros for one room in a two-bed flat — "much more than what I paid in the suburbs." If zero-carbon initiatives are to succeed, citizens need to buy into them, according to the city of Paris' climate plan, which received hundreds of proposals from residents to improve their city. Improving home insultation, for instance, can curb emissions, make people more comfortable and make a "significant difference" in their energy bills, Whittington said. "Loft insulation for example is one of the easiest things to do, but what holds people back from doing it is the hassle. When do you do it? How do you clear the loft?" 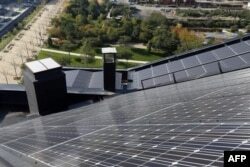 European cities have come a long way in improving energy efficiency in buildings and homes, he said, but still have a "huge body of old, inefficient buildings." "That's a missed opportunity to tackle energy waste and improve people's lives," he said. Aiming to tackle this is France's Passeport Efficacite Energetique (Energy Efficiency Passport) — a project led by think tanks and companies such as French utility EDF. It encourages householders to renovate their homes step by step. Still in its pilot phase, the project involves auditing the energy efficiency of homes and storing any progress made — such as the use of more efficient lighting — with an online tool. Musanga, whose building is not yet equipped with solar panels, said he is open to the idea but "wants proof" that going greener can save him money. "If it helps the planet, then that's a bonus," he said, tying on his rollerblades before disappearing into the distance.